“edge control”? – This Square Peg. January 27, 2017 Categories Beauty, Hair, Hilarity, Me, Womanafro, beauty, curly, hair, Hilarity, me, natural, natural hair, naturalista, woman5 Comments on “edge control”? Lol – I, too, have taken off the scarf and admired how laid they were…and then a few minutes later they’re right back to bushels of wild hair. 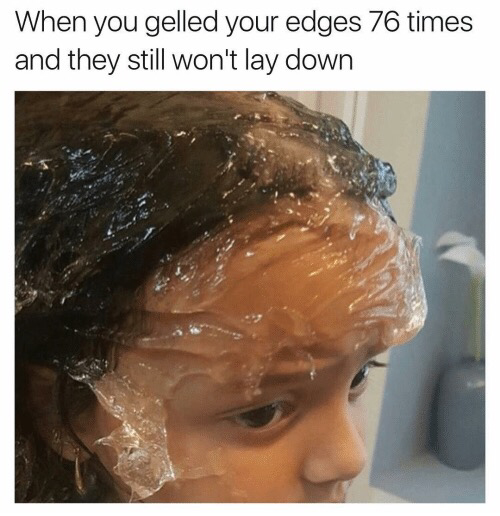 These edges are tricky. Lolol. Thanks for commenting! Pingback: slay-o’clock. – This Square Peg. Pingback: fruit salad. – This Square Peg. Pingback: The Frompadour Files. – This Square Peg.